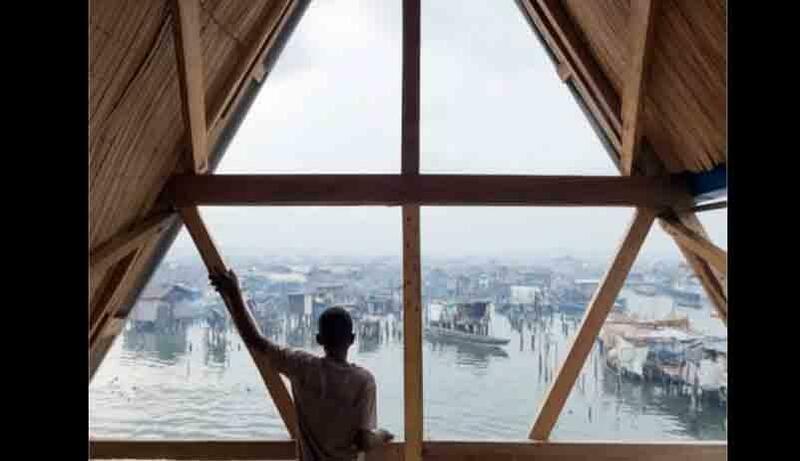 "Standing proudly like a cathedral in the middle of a Nigerian slum"
Nigerian architect, designer and urbanist Kunlé Adeyemi, the brain behind the Makoko Floating School in Lagos, Nigeria, calls himself a 'waterholic' and has three obsessions: water, cities and Africa. "Water is one of the most important elements on this earth," says Kunlé. "It will reshape our future. Seventy per cent of ther earth's surrface is covered by water. It's always around us, but I think we tend to take it for granted most of the time." "Cities are man's greatest invention. It took me quite some time to understand the relationship between the city and water. Historically, water has always played a very important role in cities. The increased frequency of flooding in Africa creates very difficult living conditions for many people. I designed the Makoko Floating School to give the people of Makoko City something that would help them to cope with this problem. I was shocked to see the people's living conditions when I first came here. But although many things are lacking, African people are very adaptable and resilient, and create their own habitats. There is a huge sense of adventure, it is a vibrant place and I realized I could learn something from it. Makoko is a place with many problems, but at the same time it offers huge opportunities. It is very important in our work to understand the social and cultural conditions of people in their environment. 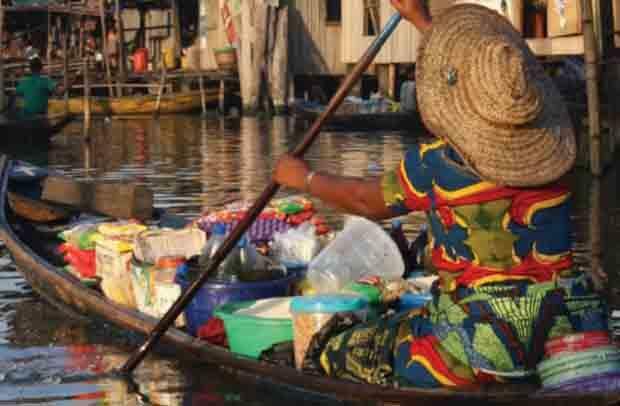 Our contacts with Makoko inspired us to set up the African Water Cities research project, in which we look at the impact of various parameters such as population growth and migration patterns on the development of water-based communities in Africa." The Makoko Floating School was built in a lagoon in Lagos, the capital of Nigeria, at the initiative of Kunlé Adeyemi from NLÉ Architects in Amsterdam. It was designed and constructed in collaboration with the Makoko Waterfront Community in Lagos and two Dutch architects, Robert van Kats from BKVV Architecten in Amsterdam and Erik Wassen, naval architect at Dykstra, Amsterdam. The project was initially self-funded by NLÉ, but later received research funding from the Heinrich Böll Foundation. NLÉ focuses on developing cities and communities and has a strong social and environmental ethos. Its founder, Kunlé Adeyemi, has a track record of conceiving and completing high-profile, high-quality international projects. 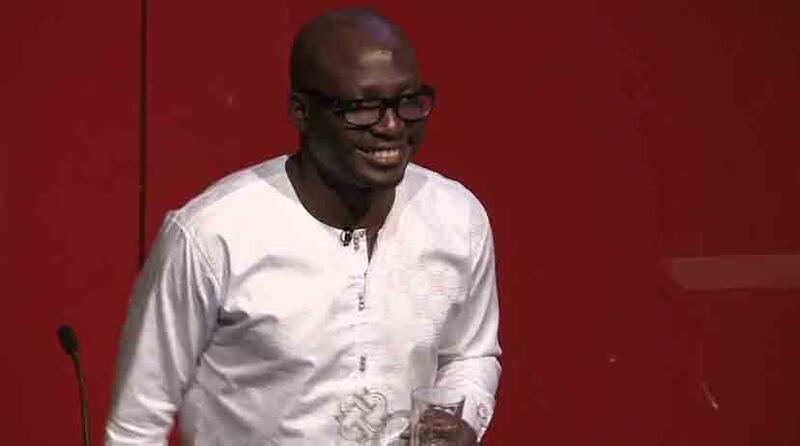 Born and raised in Nigeria, Adeyemi studied architecture at the University of Lagos where he began his early practice, before joining the world-renowned Office for Metropolitan Architecture (OMA) in 2002. At OMA, working closely with founder Rem Koolhaas for nearly a decade, he led the design, development and execution of numerous projects in Europe, Asia, Africa and the Middle East. 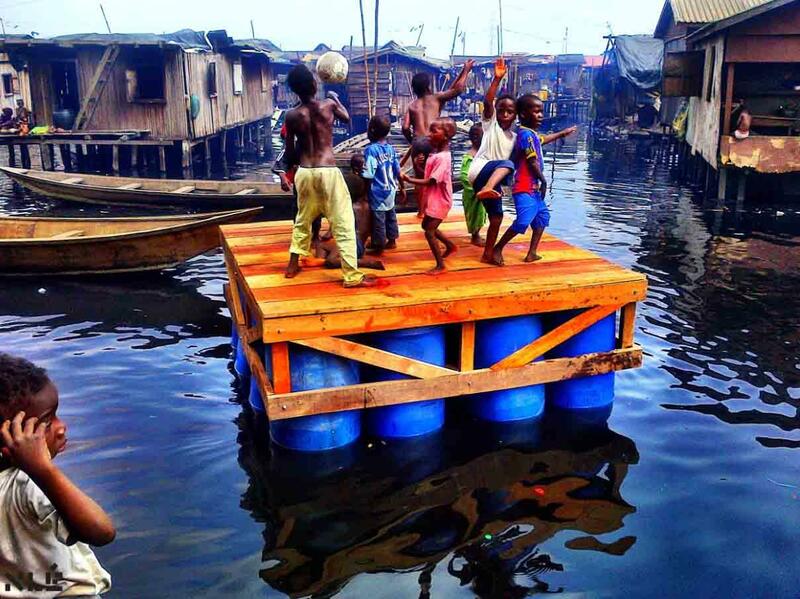 Kunlé Adeyemi emphasizes that people all over the world, like the boy in the photo on the left, share the dream of building and living on water, the element that covers such a large part of the globe. This dream is particularly lively in Africa, which as seen more and more flooding in recent years as a result of climate change. Like the major flood in Lagos on 10 July 2011, where large parts of the city were completely inundated and people were struggling to reach dry land. With an estimated 20 million inhabitants, Lagos is the economic hub of Nigeria, a city with some of the most expensive real estate in the world. The shanty town of Makoko, often referred to as the 'Venice of Africa', situated a stone's throw from the modern buildings of Lagos city centre and housing an estimated population of some 100,000 people in rickety little shacks built on stilts above Lagos Lagoon, is an embarrassment to the city. The neighbourhood is regularly threatened by storms, tidal movement of the water in the lagoon and floods due to torrential rain. The community has no roads, no land, no formal infrastructure to support its daily struggle for survival, no running water or mains electricity. Many buildings in Makoko are not connected to the city's sewage system: the residents simply allow their excreta to fall into the lagoon, turning it into an open sewer. Residents use canoes, punts or other small boats to get around, including young children who sometimes sell plastic bags of drinking water from their boats since the water of the lagoon is so highly polluted. The authorities want to turn Lagos into an ultra-modern city, like Dubai, but have no place in their schemes for Makoko. This settlement, which grew out of a fishing village established in the 18th century, is under threat. Lagos State Government has called the area an environmental hazard and an ecological nightmare. Some houses have already been demolished, and the destruction of this historic community may continue in order to redevelop what the city authorities now see as prime waterfront. The members of the fishing community fear for their livelihood. Life in Makoko City is a matter of making do and improvising. For example, most of the residents cannot cook in their wooden shacks because of the fire hazard so they buy their food ready-made to avoid stress (Source: Donald Olajhide Falayi). 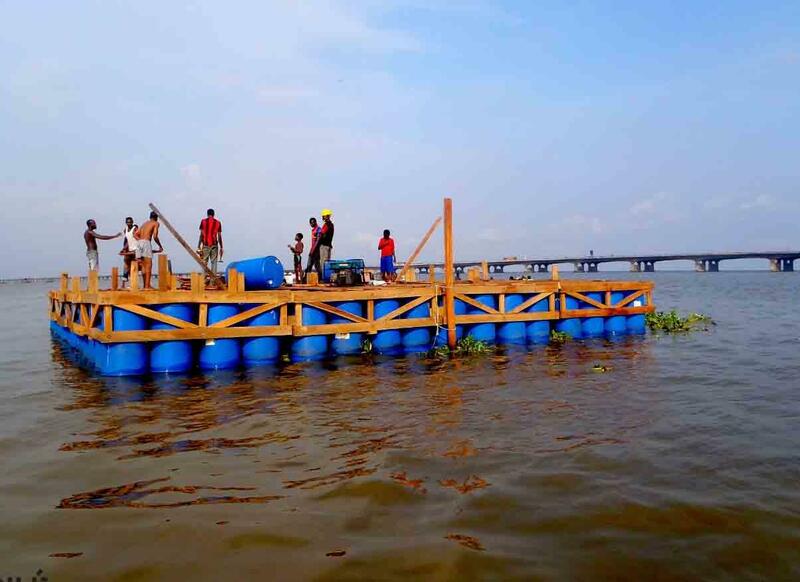 The Makoko Floating School, which is sponsored by the United Nations, is a prototype floating structure, built for the coastal water community of Makoko located on the lagoon of Nigeria's largest city, Lagos. This pilot project takes an innovative approach to addressing the community's social and physical needs in view of the possible impact of climate change. The structure is an A-frame or pyramid with a base measuring 10 x 10 m (and hence a base area of 100m2). This is an ideal shape for a floating object on water due to its relatively low centre of gravity, which provides stability and balance even in heavy storms. The structure can safely support some hundred adults, even in extreme water conditions. The Floating School will be on display at the Museum of Modern Art in New York soon, and has won the Holcim Award for sustainable construction. The building has three levels. The bottom level offers an open playground for school breaks and assembly, with a green space. The second level is an enclosed space for two to four classrooms, providing enough room for sixty to a hundred pupils. A staircase at the side connects to the open play area, the classrooms and a semi-enclosed workshop space on the third level. The simple yet innovative structure adheres to ideal sustainable developments standards with its inclusive technologies for renewable energy, waste reduction, water and sewage treatment and facilities for low-carbon transport. 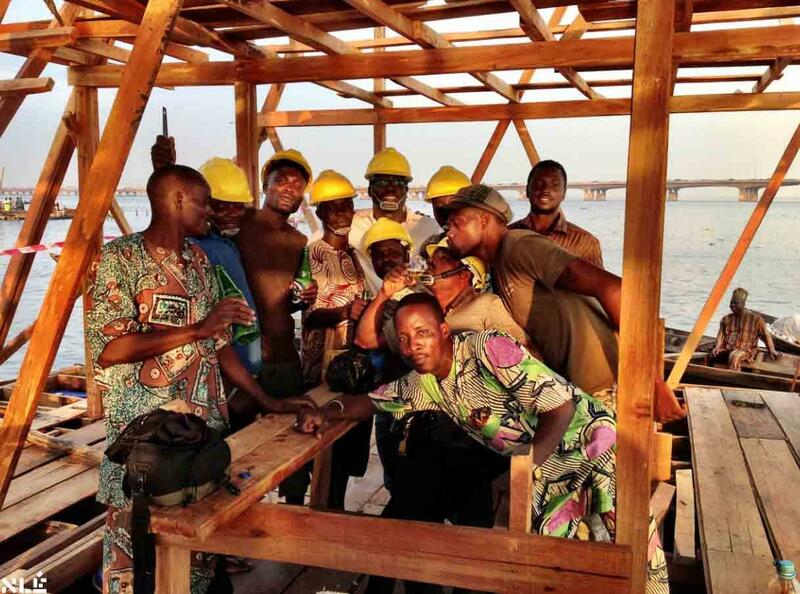 A team of eight Makoko-based builders constructed it using eco-friendly, locally sourced bamboo and hardwood procured from a local sawmill. Construction began in September 2012 and the project was completed in March 2013. The structure as a whole is constructed from locally available materials such as hardwood, bamboo and aluminium. 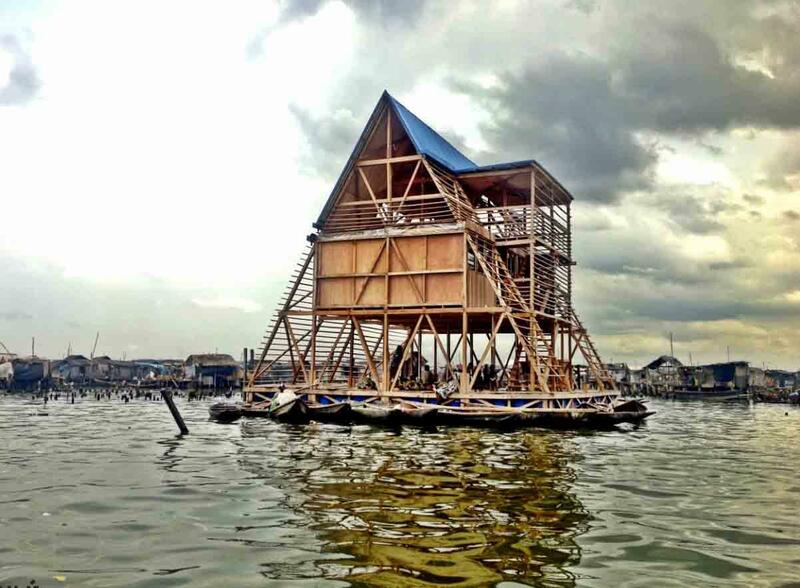 According to Kunlé Adeyemi, the Makoko Floating School is "a model for how coastal African cities can develop". The old school was situated on a patch of reclaimed land on the waterfront and was subject to flooding on a regular basis, like most of the houses in the neighbourhood, because of the rainfall and the steadily rising water level in the lagoon. The new building is anchored in the lagoon by metal poles to permit vertical movement when the water level changes. Despite living above a lagoon the residents of Makoko do not have ready access to fresh water, since as mentioned above the water in the lagoon is severely polluted. Most people buy jerry cans of fresh water from hawkers and many have to re-use polluted lagoon water for washing and bathing. Five of the plastic floatation barrels under the floating school are used to provide the necessary storage capacity for 3,000 litres of drinking water. Access to electricity is also very limited in Makoko. About 5 %of the residents have mains electricity, 19% use generators while everyone else uses candles and lanterns. The floating school has its own electricity supply, provided by solar panels mounted on the roof. As mentioned above, two Dutch architects formed part of the team that was responsible for the design and construction of the floating school. Robert van Kats from BKVV Architecten in Amsterdam has spent a lot of time on construction projects in Africa in recent years, as has BKVV as a whole. His first African project was the design of Mouila University campus in Gabon. Shortly after that, he met Kunlé Adeyemi at Delft University of Technology, where both of them were giving a lecture. 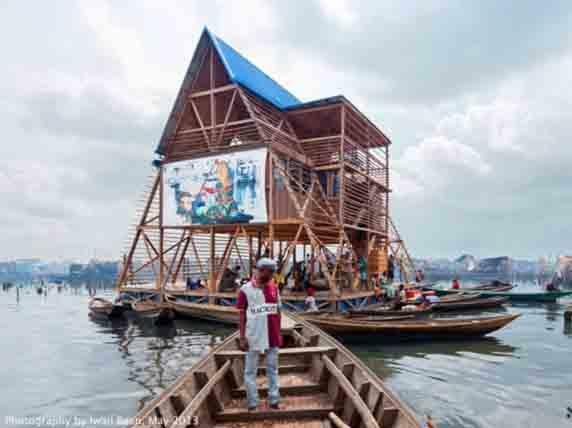 Robert was keenly interested in Kunlé Adeyemi's plans for the Makoko Floating School. 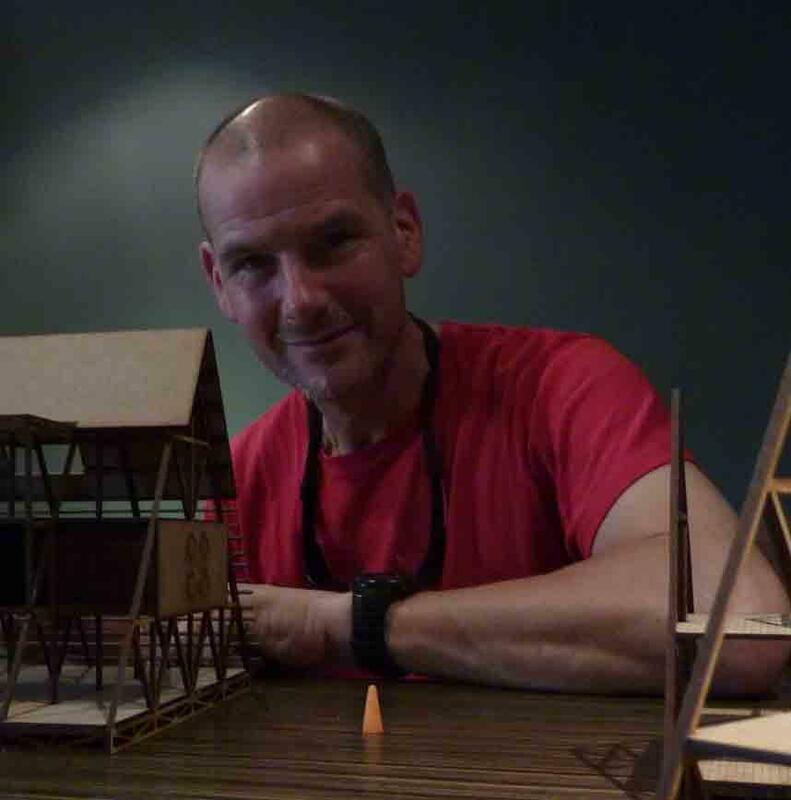 Their initial contacts led Kunlé to invite Robert and the rest of the BKVV team to exchange ideas on the design of the floating school and to provide the project with technical expertise. This is only one of the many cases where BKVV has worked fruitfully with other partners on challenging projects. "Sharing knowledge and cultural insights between African and Dutch professionals can often lead to remarkable breakthroughs," says Robert. "This certainly proved to be the case in the Makoko floating school project, although Kunlé Adeyemi's commitment and enormous drive also played a key role." BKVV Architecten, which was founded in 2008, has built up a wide range of experience of building in Africa. "We can really claim to be Africa experts, thanks to all the projects we have participated in," says Robert van Kats. "We even act as consultants on projects where we did not do the design. We enjoy working in Africa: the people are very hospitable, and there are plenty of opportunities on the ground. 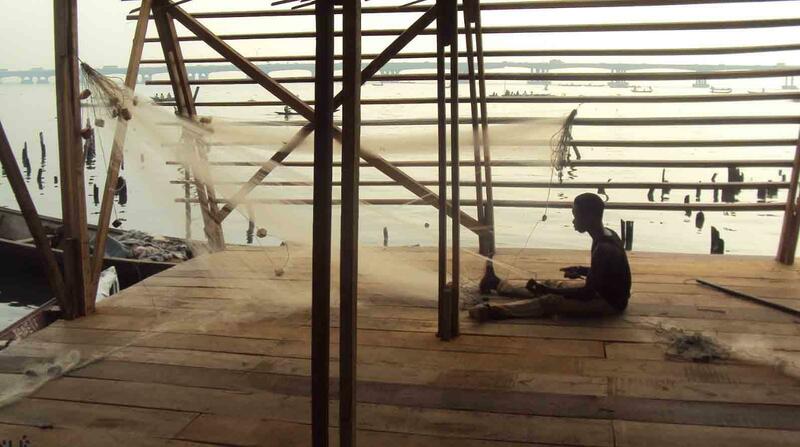 One key success factor in the Makoko Floating School was the ability to think up smart ways of building on water. Our expert on the team found out quite simple ways of ensuring stability and buoyancy for the structure. The know-how of Dutch architects, who are acquainted with the problems involved when building on or near the water and can find effective solutions to these problems, can be extremely valuable to our African clients." "The initial ideas began to take shape in 2011. The school was built exclusively with the aid of local resources, including local residents and small contractors from Makoko. The school is moored in water that is only one or two metres deep. The main thing we discovered with the aid of Erik Wassen, who had trained as a naval architect, was that the most effective way of keeping the school afloat was to use recycled blue plastic barrels. Eric calculated that you got the greatest buoyancy if the barrels were mounted upright in a frame. But the school needs to be stable as well as staying above water. One of the best ways of achieving this is to give it a triangular cross-section, so that the centre of gravity is low, thus avoiding the risk of capsizing. Now that we have shown in practice that a floating school is a feasible option, we can explore other possible applications of this principle, such as floating homes, floating hospitals and the like. Kunlé Adeyemi and I intend to meet in the near future to discuss the scope for turning Makoko City as a whole into a floating city. Kunlé is already enthusiastic about the idea, but you need to convince the Nigerian authorities and all other stakeholders too." 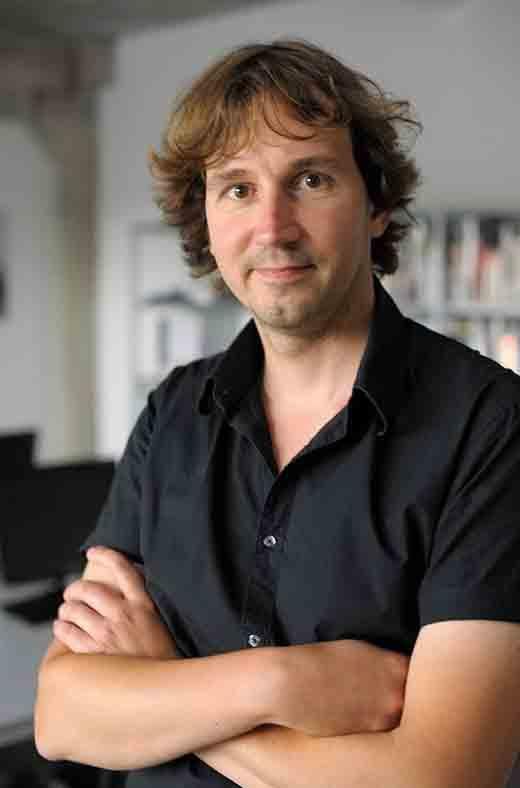 Erik Wassen managed to design the floating school in such a way as to achieve optimum stability of the structure with minimum expenditure on material. "I am a naval architect and most of the time I design big yachts for Dykstra in Amsterdam; but this job looked like an interesting challenge. The other members of the design team team had no experience of floating structures at all, so my task was to concentrate on stability, the proper distribution of the weight and the overall buoyancy: what is the best orientation of the plastic barrels to ensure that they can provide enough buoyancy to support the structure as a whole? You need to calculate the overall weight of the platform, the three storeys built above it and all the people and objects placed on them, and then you have to ensure that you have enough buoyancy to support all the weight. I initially thought of placing the plastic barrels horizontally, but if you place them vertically this gives you enough buoyancy to lift the platform far enough out of the water. Besides, when your floating body is higher you have more spare buoyancy." Erik continues: "The stability of the platform has to be calculated too, that means that you have to work out how much the structure tilts when it is subjected to a given wind force. To achieve the optimum stability, we had to make in particular the bottom storey heavy and rigid enough to give the platform the desired strength and stability. We succeeded in making the structure sufficiently rigid, and to divide the overall weight uniformly over the platform as a whole." "We also had to work out an effective but inexpensive way of mooring the floating school," Erik continues. "The local community did not have the funds to pay for an expensive mooring system. They started by making a few anchors out of the steel rods used for reinforcing concrete - a bit like big fishhooks - but they did not work well. The bottom of the lagoon is covered with a layer of soft mud, and those anchors went through that like a hot knife through butter so we had to think up another approach. We eventually decided to use a number of steel piles driven firmly into the bottom of the lagoon and connected by partitions. This gave a solid base to which the anchors could be fixed to hold the floating school firmly in place. That system worked perfectly. I was there for the school's inauguration ceremony. It looked wonderful, rising up like a cathedral in the middle of the slum."